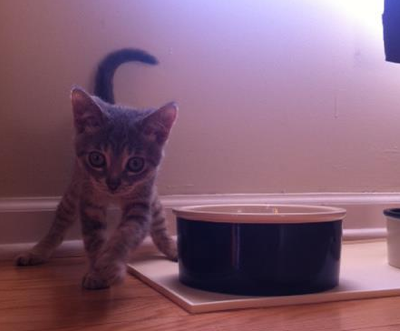 Adopting a significantly wobbly kitten can certainly be intimidating. CH kittens can be so tiny and so wobbly that they can certainly make you second guess if you’ve made the right decision for everyone. But don’t worry. As we’ve learned, like the human brain, the cat brain is known for its plasticity, meaning that it can rewire itself in order to do things that the originally damage or underdeveloped part of the brain can’t quite manage. That means that the severity of your cat’s cerebellar hypoplasia will likely lessen over time, as your cat’s brain rewires itself. Need some proof? One of the best examples I’ve found is a video on YouTube. Funny enough, when I first watched it, back when I was deciding to adopt CG, I never watched it the whole way through! For at least a year, the Gordon video (as I called it in my mind) was simply a great video that showed how CH could impact a kitten. It wasn’t until a while later that I realized the true value and genius of the video — and it takes place around the 0:35 mark. The video doesn’t only show how impacted Gordon was as a small kitten. It also shows how wonderfully capable he became a year later. His owners say that now he functions just fine, and while they take a few precautions to ensure his safety, none of it is a hassle considering all of the love they give and get from this special guy! Over the 4years we’ve had Chairman he’s improved a lot. He still has his bad days of course, but he’s way more capable. Both our CH cats, Kitty and Half-and-Half, have improved over time. When Halfie is tired or overexcited she’s more wobbly. Kitty has shorter legs and is lower to the ground, so she seems more stable when walking. Gordon improved tremendously, great encouraging video! Chairman gets more head tremors when he’s excited. I have to vocally soothe him so he can manage things, in that case!